This experience is about opening the five senses in a profound way by heading into the Karoo veld in the early morning, which enlivens the senses. Participants learn to draw on the power of their senses, and once this starts happening, it opens the door for intuition and instinct to develop. This is of vital importance for trackers and trail guides who need to be completely aware of their surroundings and what their guests are feeling. These three aspects of the guided experience are covered in a format that helps the participants to grow in their knowledge of not only sharing the facts of the wild with guests, but also guiding guests to become part of the interpretation process in the wild. 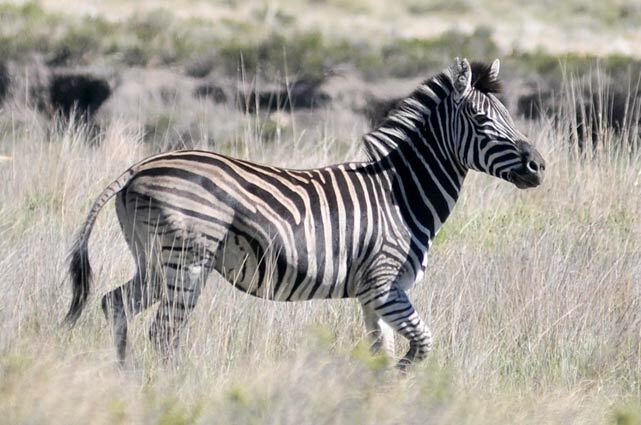 During walks on Bergplaas Nature Reserve, instead of ticking off a checklist, participants observe and discuss animal behaviour, social patterns, eating patterns, plants and grasses, and cultural knowledge of traditional medicinal uses of plants. Tracking and guiding is all about respect for the natural environment. During this experience, participants tangibly experience personal space and personal comfort zones. This raises their awareness of the impact on animals when bombarded by game drive vehicles and guided walks wanting to get too close. During this module participants explore respect and how to recognise the signs of anxiety in wild animals. The exercises further lead participants to the awareness that respect for the natural environment equates to respect for each other and respect for self. Recognising the power of our own life stories and our own inner thoughts, fears and hopes brings with it a deep awakening of self. These are the same stories, thoughts, fears and hopes from which cultural knowledge has evolved through the centuries. During this exercises participants share something about themselves and their backgrounds, which strengthens their communication skills, their relationship with their fellow participants and their awareness of their own inner truth and wisdom. This wisdom, like the roots of the giant old trees on Bergplaas, ground us in our truth and anchor us so that we can stand tall and show who we are. It deepens their connection with wildlife and wilderness. The natural environment is a living library. At this stage of the programme participants are deepening their relationship with the natural environment. They start to take note of the much neglected ancient books of the wild: rocks. In this exercise they explore the timeline written in the rocks, dating back millions of years. Once students have completed this module they often comment that they never identified with or even noticed rocks before; now they see them as the foundation of life. Other students express the sense of assurance they can derive from rocks, which remain solid and resolved despite the uncertainty of life and the future. By the end of the one-week programme participants inherently start to appreciate their individual strengths: that they are all leaders in their own right and that every person is part of the natural environment, which sustains us. This sense of belonging to the greater whole is the cornerstone of the African Ubuntu philosophy of Togetherness, which is essential to a more sustainable, balanced, democratic world. On the last day of the Programme, each participant has the opportunity to lead the group on Bergplaas Nature Reserve drawing on what they have learnt. Nanditha Sitsha - Participant from Umzi Wethu. “To be able to follow the Spirit of the Wild programme at Bergplaas Nature Reserve, was a great privilege. What happened in one week was really amazing for me to witness. All the participants that I met on the first day became very much empowered by the Spirit of the Wild programme, not only thanks to the facilitation by Cindy and Wayne (providing also a very safe environment to be in), but also because of their own courage and their will power to show themselves as their authentic selves. Each of them had his/her own role in that process, helping the other students to open up and be genuine, stretching themselves every day a little bit more. And by doing so, they became mirrors for and gave gifts to all the other persons attending the Spirit of the Wild programme, including myself. The last part of the Spirit of the Wild programme where the participants have to design and execute their own programme part, directing the other participants at the same time, was awesome. What a wisdom in those youngsters I encountered! And how capable and talented they were to use all the tools and skills that were conveyed by them earlier in the week by Cindy and Wayne, really making the programme part of themselves! I was stunned and deeply stirred by their accomplishments. For me the connection with nature and the tools that nature is providing me with to go deeper inside my feelings, emotions en make it possible to connect with my senses is something that I will take with me wherever I will be on this planet. And I will carry the other participants and Cindy and Wayne deep into my heart forever too. So thank you for this amazing adventure.” - Sascha Krijger, the Netherlands. “Ever since we started this course I feel like a different person – it was like something has grown inside me. I am actually a very shy person but now I feel a change within me. It was hard to talk about my past in front of everybody – I felt ashamed. After sharing I now feel different. I woke up the next morning feeling calm, for the first time – with nothing to stress me out. This is where I actually want my roots to grow because there are so many positive things to do. And I feel I have grown spiritually. I understand myself better now.” - Juanita Tietes - participant from Umzi Wethu.